PMEL staff at the NOAA Cooperative Institute for Marine Research Studies at Oregon State University recently participated on a hydrophone deployment cruise aboard the Spanish R/V Sarmiento de Gamboa in the Bransfield Strait off the western Antarctic Peninsula along with colleagues from the University of Washington, Woods Hole Oceanographic Institute, Queens College and the University of Granada (Spain) from January 4 - 17. 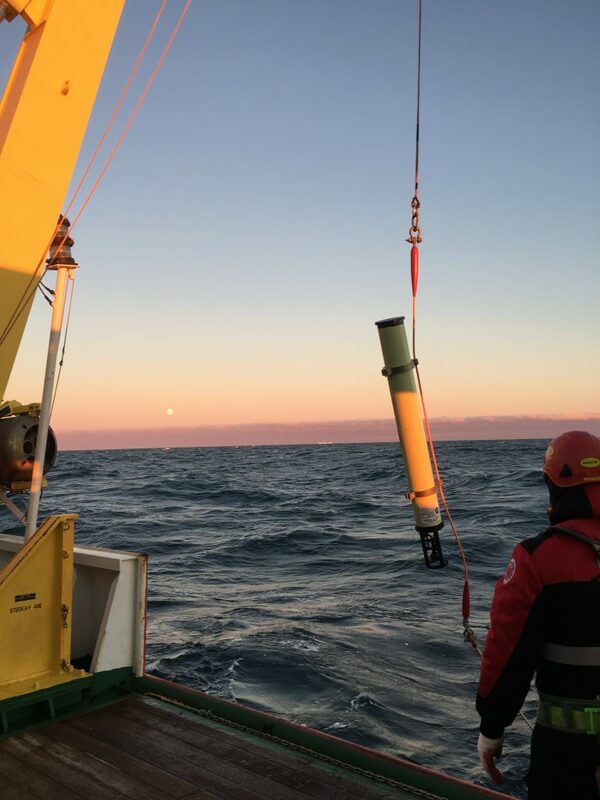 PMEL successfully deployed 6 hydrophone moorings, while the University of Washington, Woods Hole and Queens College deployed 30 ocean bottom seismometers, and the University Granada deployed 20 land-based seismic stations. The Bransfield Strait region is a highly volcanic area, with multiple, recently active, submarine and subaerial volcanoes including the active Deception Island volcano which last erupted in 1970 damaging the Spanish Antarctic base located there. Thus the goal of the project is to assess the volcanic hazard to the collection of international polar bases located in this part of Antarctica, as well as to better understand the ocean soundscape and sea-ice dynamics in the region. Using both active and passive seismo-acoustic data collection techniques, researchers will be able to image shallow pockets of magma in the crust that are likely distributed throughout the entire area. This research is funded by the National Science Foundation Antarctica Program. On October 17, 2018, a joint NOAA/PMEL and Oregon State University Marine Mammal Institute (OSU-MMI) team, with the assistance of a U.S. Coast Guard helicopter on patrol providing real time radio reports of cetacean sightings, traveled 27 miles off the Oregon coast (due west of Newport, Oregon) to acquire acoustic recordings and biopsy two North Pacific blue whales. Through MMI contacts, the Coast Guard helicopter out of North Bend spotted blue whales off shore during routine patrol, and alerted the team to their approximate location. 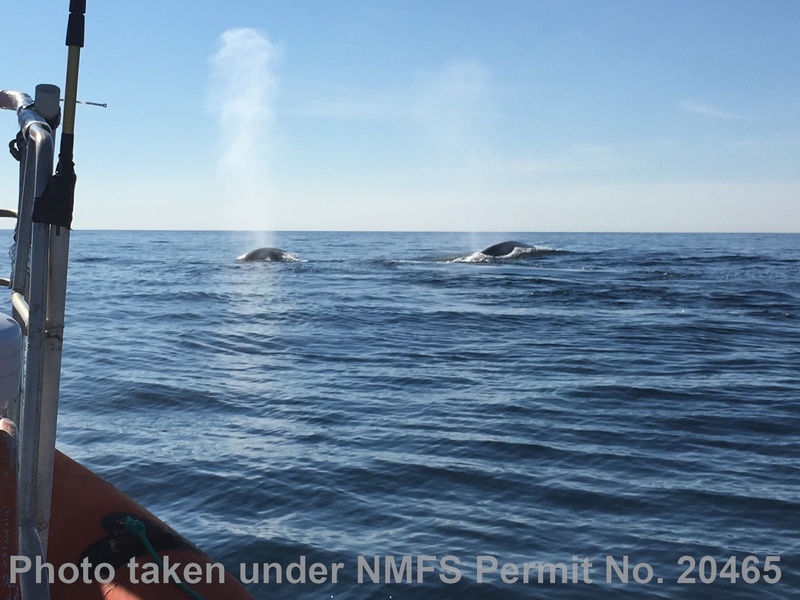 A PMEL drifting hydrophone was used to record the blue whale calls, while OSU-MMI personnel successfully collected a biopsy sample of one of the two blue whales, and documented the encounter with photographs. Genetic results show the biopsied animal was a male, acoustic analysis of call signal strength shows two animals observed during biopsying were likely source of recorded vocalizations. The researchers are currently doing further genetic analysis and photo identification work to confirm blue whale population and gender of animals recorded. These data will be used to correlate the genetic identity and acoustic call type of a North Pacific blue whale. The goal is to quantify and relate call signal characteristics and genetic identity. Typically, only remote recordings of blue whale calls are used to assess population size and distribution of this endangered species. All research was conducted under NMFS permit 20465 with the support of the Marine Mammal Institute whale telemetry group. PMEL's Acoustic and Earth-Ocean Interactions programs have successfully recorded the sound of methane bubbles from the seafloor off the Oregon coast using a hydrophone, opening the door to using acoustics to identify - and perhaps quantify - this important greenhouse gas in the ocean. Methane is found both as an icy hydrate deposit and in a gas phase within the sediments of the continental margins. The methane stored in the Cascadia margin, located offshore Washington, Oregon, and northern California, is of particular interest because the methane is stored within a major subduction zone which can potentially have an environmental impact on the upper water column and possibly the atmosphere. In recent years, scientists have found hundreds of bubble streams emanating from methane deposits off the Pacific Northwest coast, but they have no way to determine how much methane is stored there. 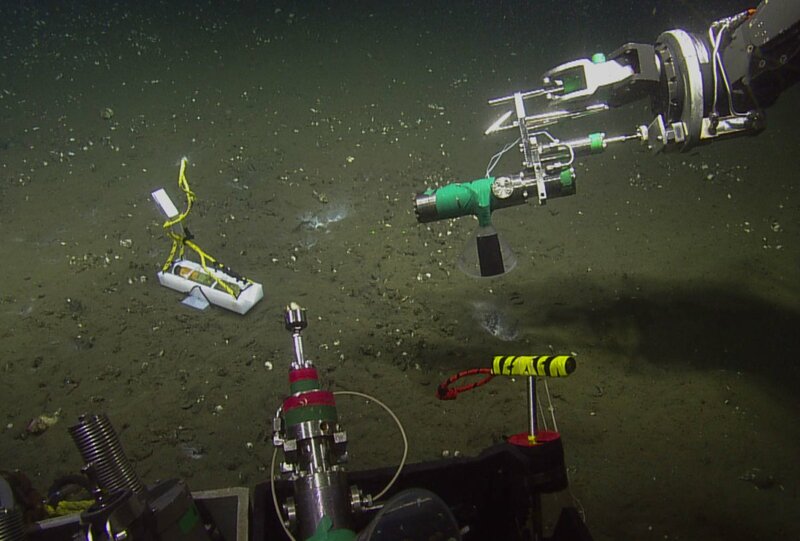 In 2016, researchers used the remotely operated vehicle (ROV) Hercules from the Ocean Exploration Trust's Exploration Vessel (E/V) Nautilus to deploy a hydrophone about 6 miles off Heceta Bank on the Oregon continental margin in 1,228 meters of water (about three-fourths of a mile deep). The acoustic signatures of the bubbles from the seep site are depicted in the hydrophone record as a series of short, high-frequency bursts, lasting 2-3 seconds. "The bubbles in the streams make sound, and the frequency of the sound is related to the size of the bubble," said Robert Dziak, an acoustics scientist with the National Oceanic and Atmospheric Administration and lead author on the study. "The smaller the bubble, the higher the pitch. And the larger the bubble, the lower the sound pitch, but the more methane it contains. The researchers then compared the sound record with still images from the ROV and found their estimates of bubble size from the hydrophone record matched the visual evidence. Results of the study have just been published in the journal Deep-Sea Research II. On the current Nautilus research cruise mapping methane seeps, a hydrophone was deployed and recovered at various depths of Astoria Canyon in order to compare how bubble sizes and rates change with depth. The next step, researchers say, is to fine-tune their ability to detect the acoustic signature of the bubbles so they can use the sounds to estimate the volume of methane in the offshore reservoirs. The ultimate goal is to be able to use sound to estimate the volume and rate of methane gas exiting the seafloor. EOI scientists talk about their work at hydrothermal vents. Join PMEL at Marine Science Day THIS SATURDAY, April 14, at the Hatfield Marine Science Center, in Newport, OR. Join tours, meet scientists, and get a behind-the-scenes look at the research, education, and outreach in marine sciences that makes this marine laboratory unique in the Pacific Northwest. Admission is FREE and open to the public. 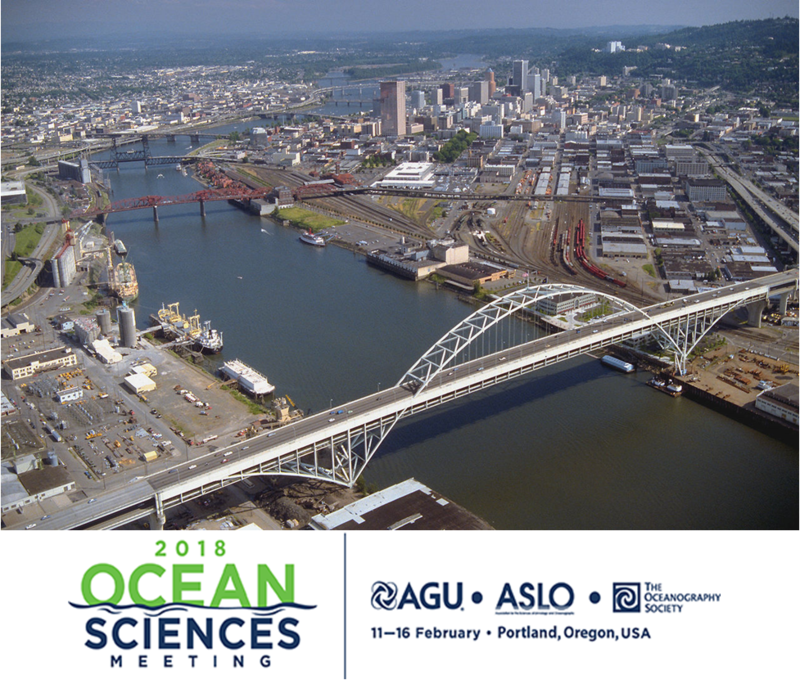 There will be interactive research exhibits that will feature emerging ocean observing technologies, bioacoustics of whales, video of volcanoes and deep ocean vents, and a new video on the emerging issue of ocean acidification. Activities for children and families can be found throughout the event. PMEL will have two booths highlighting the work done at underwater volcanoes around the world and locally at Axial Seamount and ocean noise. You'll be able to view videos from recent expeditions and listen to various recorded sounds. PMEL welcomes 9 undergraduates for the summer! 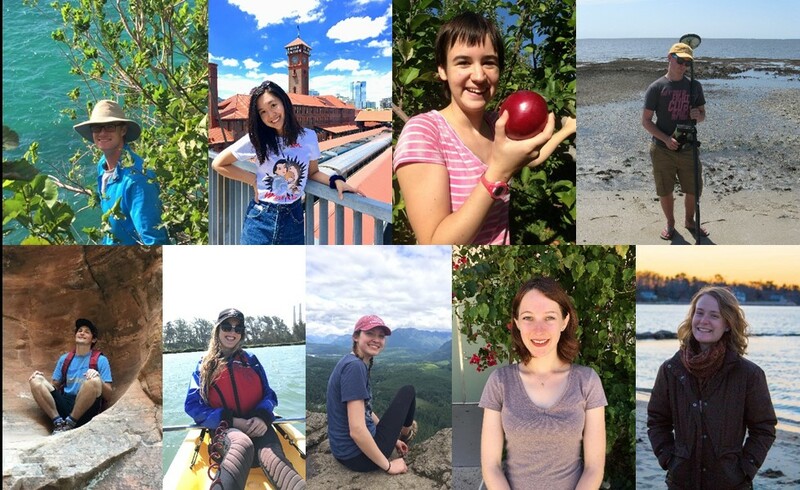 This summer, PMEL is hosting 9 undergraduate students through the NOAA’s Ernest F. Hollings Scholarship program, NOAA’s College-Supported Internship Program at Smith College, the National Science Foundations’ Research Experience for Undergraduates, and the University of Washington’s Joint Institute for the Study of the Atmosphere and Ocean (JISAO) internship program. They are working across multiple groups at PMEL: Acoustics, Earth Ocean Interactions, Atmospheric Chemistry, Ocean Acidification, Madden-Julian Oscillation (MJO), and Large Scale Ocean Physics. The students spend 10 weeks at PMEL with their mentors getting hands-on research experience at both the Seattle and Newport locations. They are all so passionate and can't wait to see what they accomplish this summer. This year's cohort are: Will Christian from Michigan Technological University, Tina Chen from Middlebury College, Max Garvue from University of Nebraska - Lincoln, Nick Barber from Drexel University, Danielle Naiman from the University of California - San Diego, Gabby Kalbach from California State University - Monterey Bay, Sophie Shapiro and Courcelle Stark from Smith College, Emily van Auken from Stonehill College. Read more about each of them and their projects here. Learn more about NOAA’s Ernest F. Hollings (Hollings) Undergraduate Program, the National Science Foundation Research Experience for Undergraduate (NSF-REU) program, JISAO summer intership program, and the NOAA College-Supported Internship Program. Deployment of a Noise Reference Station in the National Park of American Samoa on June 11, 2015. Photo credit: Megan McKenna, NPS. This week, the US Virgin Island National Park will deploy the 12th Noise Reference Station in the National Park. PMEL's Acoustic program built the hydrophone and provided the instrumentation and software. 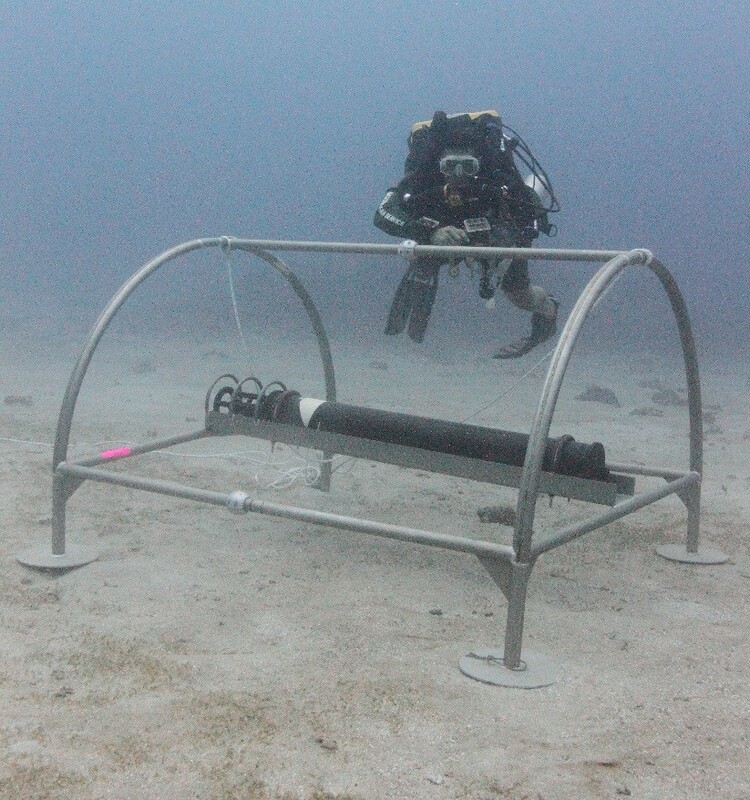 Identical hydrophones have been deployed at the other reference stations to ensure consistency across the data sets. Data collected by the NOAA Ocean Noise Reference Station Network contributes to national monitoring efforts and assesses potential noise impacts on marine resources, including endangered marine mammals and fish. This Noise Reference Station is part of a large-scale effort to monitor long-term changes and trends in underwater sound across U.S. water. The network of stations provide fundamental data to understand what ambient ocean sound levels are now, how they're changing over time and how man-made noise, such as from shipping, may be impacting marine life. The locations of the network range from as far north as the Arctic coast of Alaska to American Samoa in the South Pacific. This project is a collaboration with a variety of partners, including NOAA’s National Ocean Service (NOS), NOAA’s National Marine Fisheries Services Science Centers, NOS National Marine Sanctuary System, and Department of the Interior’s National Park Service. For more information on this collaborative project, see NOAA/PMEL Ocean Noise Reference Station Network, and the NOAA/NMFS-OST feature story. 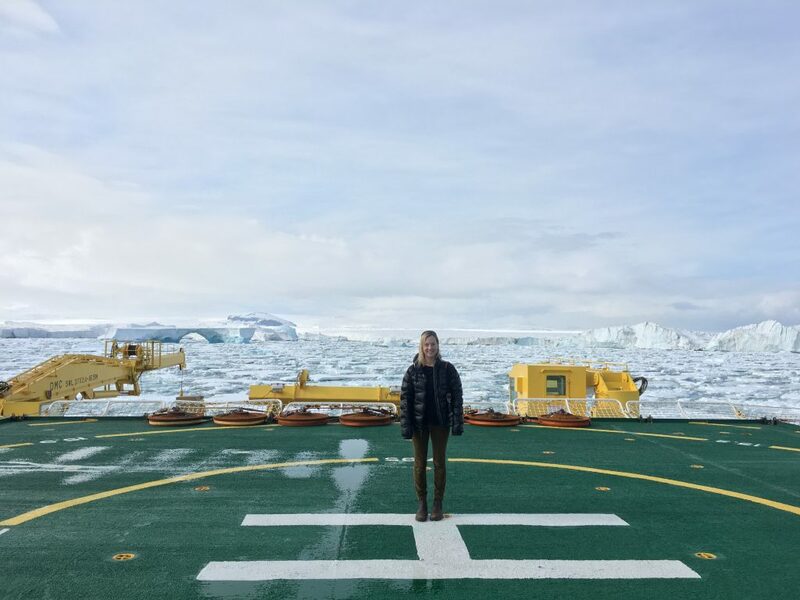 Lauren Roche standing in front of some anchors on the helideck of the IBRV Araon. 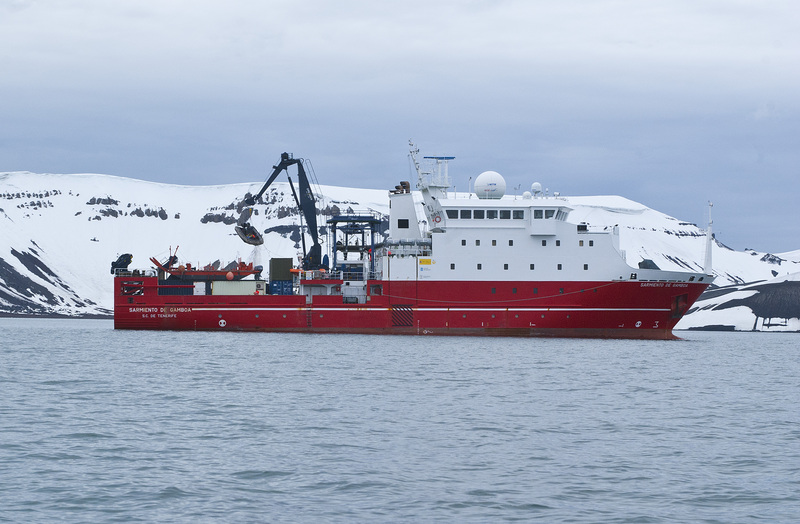 From January 21 - March 2, Lauren Roche from the PMEL Acoustics Program will be aboard the R/V Araon deploying six hydrophones (shown in the image below in the Ross Sea, Antarctica. The objective of this research cruise is to use various land- and ship-based research methods to gain a thorough understanding of the Terra Nova Bay region. The PMEL Acoustics Program has been collaborating with the Korea Polar Research Institute (KOPRI) for several years on multiple projects in Antarctica. On this research cruise, Lauren will be replacing a hydrophone triad near the Drygalski Ice Tongue that was deployed last year as well as deploying a second triad in a new location further north. The data collected from these deployments will allow the Acoustics program to characterize the soundscape of the Terra Nova Bay polynya. Lauren Roche is a new mooring technician with PMEL Acoustics Program through Oregon State University’s Cooperative Institute for Marine Resources Studies (CIMRS). Her background is in bioacoustics and fisheries and will be deploying, recovering, and building the hydrophones for the group. Learn more about the acoustics program here.